A Troy family is concerned after someone shot holes the newly installed sign for their halal butchery Sunday night. The Waldo County Sheriff's Office is investigating. A Troy family is on edge after someone apparently fired buckshot into a sign marking their new halal butchery that had been installed outside their home and business just hours earlier. Al-Rawi put up the sign for the first time Sunday afternoon. A few hours later, as Piper was putting her son to sleep around 8:30 p.m., she heard a loud “crack,” and asked Al-Rawi if it sounded like a gunshot. It’s not unusual to hear shots in Troy, but it was unusual to hear one after dark that sounded so close. The next morning, Al-Rawi went outside and noticed damage to the sign. At first, he said, he thought it was just dirt or mud, but as he got closer he noticed eight holes. The family then called police, who believe the damage was likely caused by a shotgun loaded with buckshot, based on the number of holes and the fact that the family only heard one shot. Buckshot typically contains nine pellets within a single cartridge that spread out over a wide area after being fired. Piper said she’s worried about the safety of her family, including her two young children. She believes someone targeted their business because of their faith. 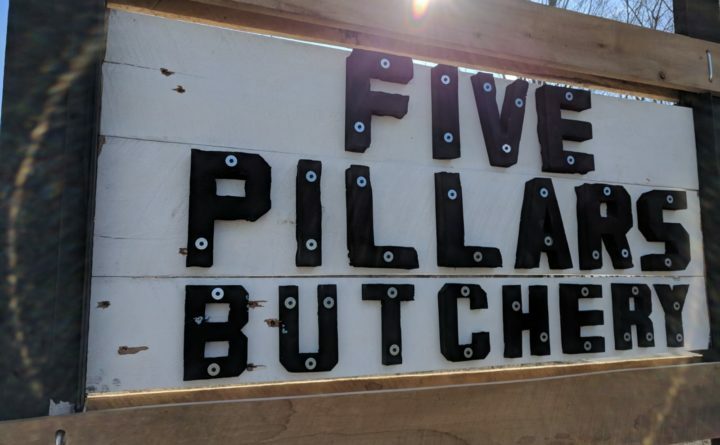 The sign doesn’t explicitly identify Five Pillars as a halal butchery, though the name is a reference to the five pillars of Islam — declaration of faith, obligatory prayer, compulsory giving, Ramadan fasting and pilgrimage to Mecca. Al-Rawi also has a business vehicle that is labeled with the butchery’s name and a “halal” sticker. Piper said she often wears a hijab outside the home, and her family does not hide its religious beliefs or practices. The Waldo County Sheriff’s Office confirmed Tuesday that it’s investigating the incident. Piper said she doesn’t hold out much hope that they’ll find a suspect. The deputy who arrived didn’t find a shotgun cartridge, and no one saw a vehicle coming or going. The family is worried something similar might happen in the future. Detective Matthew Curtis said it’s too early to determine whether this might be treated as a hate crime if a suspect is ever identified. Al-Rawi has since repaired the sign, and continues to operate the business. Piper, who was raised in a New England Methodist family, converted to Islam in her 20s after learning more about the religion from a friend. She said she never felt connected to Christianity, but Islam clicked with her in part because the teachings of the Quran hold mothers in high esteem. Piper, 35, and Al-Rawi, 43, met several years ago at a bowling alley in Saudi Arabia, where she was teaching English and he worked as an architectural engineer. The couple married and had a son there, then moved to the Maine in 2016 to be closer to Piper’s family. Their son is now 3 and they have a 15-month-old daughter. As a Muslim family, they eat halal, following a set of Islamic dietary rules. Under halal, animals must be slaughtered using a very specific method in which the animal is given water and spoken to gently before being killed quickly while facing toward Mecca. A prayer or dedication is also spoken during the process. In life, the animals also must be raised humanely, be well fed, and allowed to roam outside. “We’ve been eating hot dogs for months now and we were getting sick of it,” Piper said. These struggles sparked their idea for the business, which started making its first sales last year. Piper and Al-Rawi encouraged anyone who wants to know more about halal to visit their website, or just stop by the business. They say they welcome any conversation about their business, their family or their faith. “It’s important for people to get to know their neighbors,” Piper said.